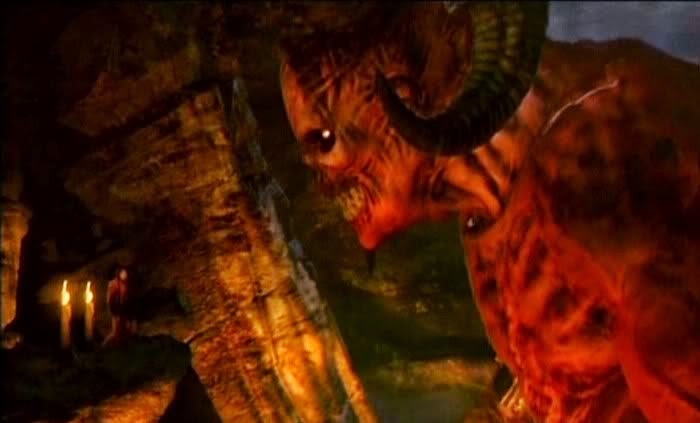 Just like Satan would, he plays on the fears of every living being. He uses our fears until we feel utterly alone. Those are the times that I feel most vulnerable and weak. The adversary tells me that I’m alone, that I have no friends, that I am not loved, or some other twisted tale. The adversary loves to use half-truths. Yes, I may be alone at this moment. Yes, I may be having a hard day. I may have had a bad day at work. I may have failed a test (thank goodness I’m not in school right now). But even if those things are true, what makes his version of the truth any better than God’s? The truth, the better truth, is that God loves me. God knows I am of infinite worth. God sent His Son to suffer for me because He loves me. God is my Father. God wants me to be close to Him. God cares for me. God will always do what is best for me. I don’t know about you, but one of those stories sounds a lot nicer and happier than the other. If I focus on the negativity of Satan, darkness will fill my life, but if I will listen to the light of the Savior and to the Spirit, He will bless me with truth, comfort, and love. I’ve seen this in my life and I know it to be true. 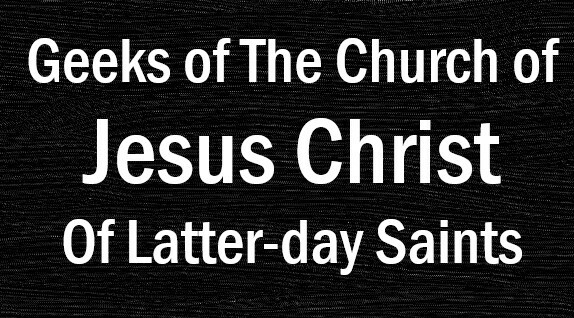 The Savior loves me and He will always be there for me. 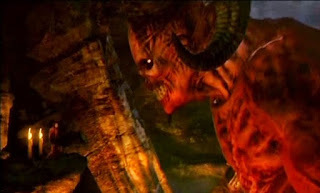 Satan is alone. He will always be alone. He will never have a body, a family, or the experience of this mortal journey. He will never be happy. On the other hand, I have a body, I have my friends, I have my family, I have my agency, and I choose to be happy surrounded by those who love me. 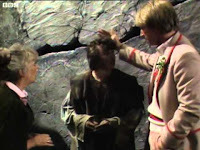 Just recently I finished the Fifth Doctor’s last story. I’m a little apprehensive about continuing with the Sixth Doctor, but I’m determined to do it. But first, I really enjoyed the Fifth Doctor. 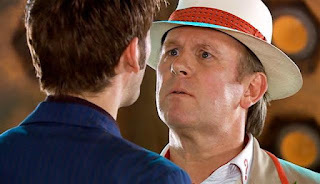 In a way he’s a bit of a legend in his own right, with his daughter playing the Doctor’s daughter and his future son-in-law playing the Tenth Doctor, but we’ll probably touch on that more later. her job, only for her to return later. I had low expectations of this story, since Peter Davision had said on his panel at SLC Comic Con last year that he would have redone this one. All the same, this story had a very fresh take on time travel, which I enjoyed. Kind of like how “The Day of the Doctor” used the rifts in time, instead of the TARDIS, to get the three Doctors together. The worst part of this story was just how slow it started. I almost picked “Castrovalva”. The premise is interesting, having figures from multiple eras on Earth all put together. However, I spent a long time on this story waiting for something to happen. The mystery of the story was satisfying, but the new Doctor spent a long time standing around. The Cybermen returned in "Earthshock"
Despite how much modern Doctor Who fans talk about the companions always dying, it’s not that common. 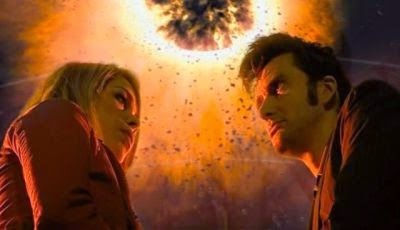 It took almost 20 years for a regular companion to die (Katarina died with the First Doctor, but she wasn’t around that long… it’d be like if Adam had died on Satellite 5). Amy and Rory lived out their lives in the past, Clara was pulled out of time, Donna was mind-wiped, and so on. However, it’s uncommon for a companion to straight up die. 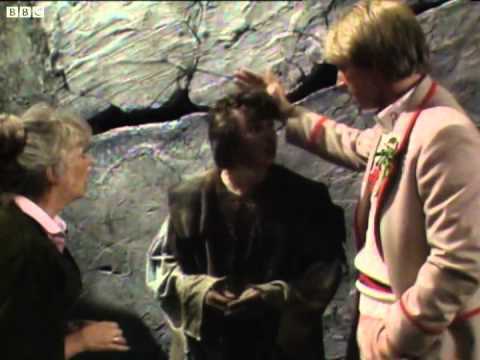 That’s what happened to Adric. So even though I didn’t care for him, it was a tragic episode for the Doctor to lose a friend. 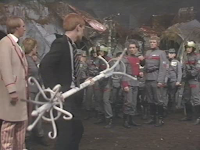 Tegan and the Doctor get captured by Omega. I enjoyed the fresh take on time travel. Like Time-Flight it was refreshing to see something new. 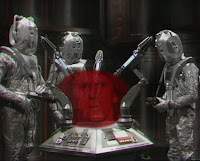 This episode also saw the return of Omega, who was last seen and defeated in ”The Three Doctors”. It was also nice to see Tegan return. Despite her annoying whining when she was first taken by accident, she grew on me. But more on that later. The return of the Master and the introduction of Kamelion. Again, interesting premise, but the use of Kamelion was too complex. Kind of over-complicated the story, in my opinion. In the end it was just one of those stories that I had a hard time getting into. We got Turlough introduced here. Not my favorite companion, but not my least favorite. More importantly in my mind is that this was the return of the Brigadier (first appearance since “Terror of the Zygons” seven years before) and the Black Guardian (first appearance since “The Armageddon Factor”). I didn’t particularly care for the trilogy of Black Guardian stories, but it was great to have these characters return. a coat rack was a weapon. This story had the kind of feel that I like in modern Doctor Who; the TARDIS is gone, the natives are suspicious of the Doctor and companions, and some alien mystery starts unfolding. I liked the way the story unfolded, built up, and then resolved itself. Nice and clean. I don’t know what it is, but I guess I just don’t like Silurian stories. I’ve said it before, but the Silurian stories all feel the same. Again, maybe I’d feel differently if I hadn’t seen the Eleventh Doctor Silurian story, but still. Madame Vastra though, I’ll take her any day. The story overall was kinda meh, but I’m giving this one honorable mention for one reason alone: the crack in time and space. It functioned differently than the crack in the Eleventh Doctor era, but I’d be cool if it was also crack caused by the TARDIS exploding. 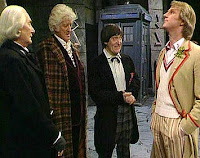 The 20th Anniversary called for a return from the five doctors and five companions. It would have been wonderful if Tom Baker had agreed to return, with Sarah Jane as his companion. However, it was clever of them to use leftover footage from an unfinished story to include the Fourth Doctor and Romana anyway. If I had to change any of them companions, I’d have put Jamie or Zoe with the Second Doctor instead of the Brigadier and I’d have put Jo with the Third Doctor. All the same, just look at how many companions returned, even just as hallucinations. I’m also glad they could tastefully have another actor play the First Doctor. That paved the way for another actor to play him this Christmas. 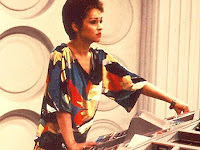 Favorite Companion: She annoyed me at first, but I really grew to like Tegan Jovanka. She had some definite character development. She went from being an annoying, whiny brat to becoming a loyal, sassy friend for the Fifth Doctor. My biggest complaint is that her exit was so abrupt. 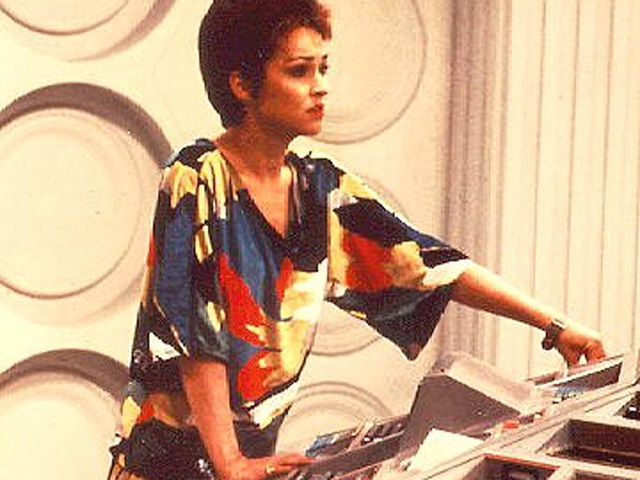 I could kind of see them taking the Doctor in a darker direction, but Tegan’s reaction seemed to come about suddenly. However, as of 2010 the character is still alive (as noted in the Sarah Jane Adventures) and the actress Janet Fielding is still alive, so it’s not unreasonable to think that she could reappear at some point. Fingers crossed. 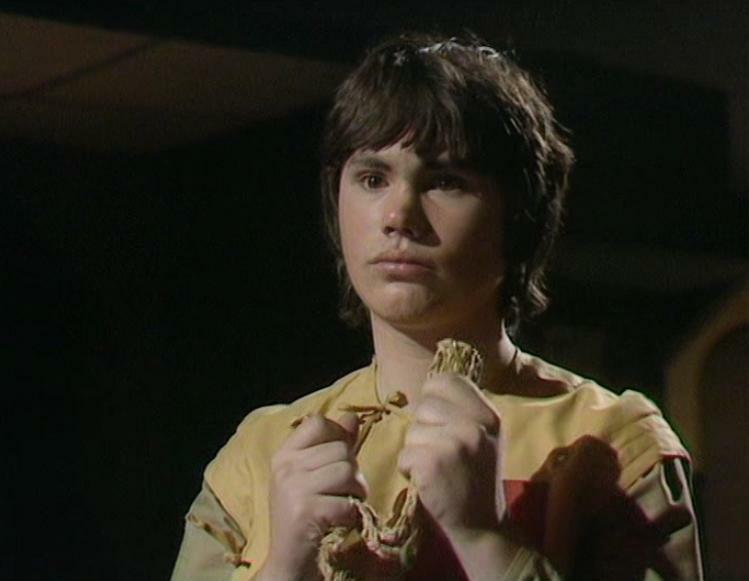 Least Favorite Companion: I mentioned last time that Adric was my least favorite of the Fourth Doctor companions. 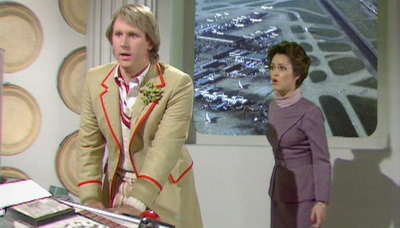 It was all because of Fifth Doctor stories I’d seen. He ends up as this annoying, arrogant teenager who constantly defies the Doctor and oversteps him. Not only that but on multiple occasions he selfishly aids the enemy of a given story because he’s being an angsty, prideful teenager. However, I enjoyed his resolution. He died a hero and his death was satisfying (and not even because I didn’t like him). I would love to see more companion exits like that (minus the death part). 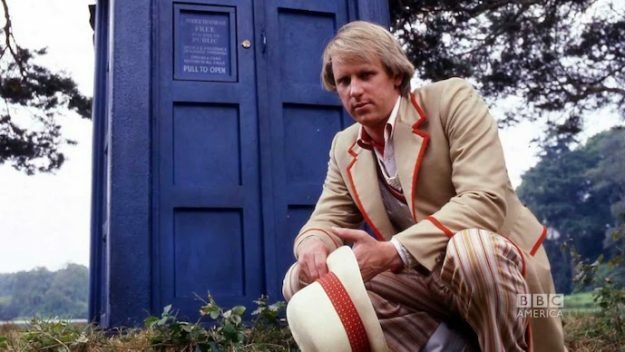 Any favorite Fifth Doctor moments? Any companions you'd like to see back? I'd be up for Tegan and Nyssa at least. charity short with his future son-in-law.